Recently I have been fighting the funky emotions of procrastination. When I first began this blog I had set the intention of writing once a week, and posting every Thursday. Marie Forleo, life coach and founder of B School, says that consistency is key when communicating with your audience. (Hello? Anyone out there?). The first week it happened innocently enough, I became too ‘busy’ and I put it off for the next day and never got to it. The second week was similar to the first except this time fear had entered and I began to feel that I had nothing of value to say. So I put it off. By the fourth week I had pushed the responsibility of my intention to the farthest part of my brain, that I let go of it completely. By the fifth week I began to feel guilt to the utmost level. My desire is to help as well as motivate others, but how am I able to do that if I cannot even help and motivate myself? So I start at square one. I begin by helping myself: reaffirming with I Am statements (I am good, I am self-accepting, I am worthy), and taking better care of myself by doing more yoga, changing my eating habits, and starting to run. This start begins to help motivate me into the right direction. I read The Staying Power of Intention by Richard Miller, PhD in Yoga Journal Magazine. This article has helped me to reaffirm my intention of writing once a week and posting to my blog every Thursday. He wrote: “Sankalpas, as intentions are known in yoga, are your heartfelt, intuitively sensed attitudes that unfold within you over time. They are powerful internal agreements that you make with yourself and then express through your actions, whether it’s in your relationships, at work, or on your yoga mat or meditation cushion. Sankalpas foster focus, motivation, determination, patience, and perserverance – all qualities that enable you to develop, sustain, and deepen a meditation practice.” Or any practice that we so choose to set out intentions on. I could not have written it any better. Whatever it is that is your heartfelt desire, set your genuine sankalpas (intention) and reaffirm it every morning when you first wake up. My favorite part of my herbal lessons so far are making herbal oils. It is so simple, yet so rewarding. Once complete they could be used on their own as a medicinal oil, massage oil, and bath oils, or made into salves and balms. I’ve deduced from my reading that the favorite oil used amongst herbalists as a base is Extra Virgin Olive Oil. Rosemary Gladstar writes that ‘the olive tree is considered sacred, medicinal, and legendary in many cultures’ and I have used it myself for a few of my healing salves. I have also used, and love, almond oil and grapeseed oil. You can also use apricot kernel oil, and coconut oil. It is best to use dried or fresh wilted herbs. I will admit that I have not used fresh wilted yet, but it is on my to-do list. Gladstar reccomends to fresh wilt an herb by placing the freshly picked herb in a warm shaded place for several hours or overnight. Most of the moisture from the plant must be evaporated before it is ready to be used. 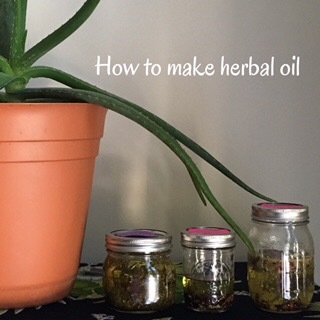 The proportions I use when making my herbal oils is 1 cup of oil to every 1/4 cup herb(s). This is not standard, and other herbalists have said that as long as the oil rises up an inch or two above the herbs than you are good. So far in my experience some herbs tend to float so I would be aware of that and not go overboard on using too much oil just because you are trying to maintain that inch above. There are four methods in making herbal oils. I have only used the solar method, and will most likely continue to only use that type of method. You have to be careful using the other methods so that you don’t fry your herbs and sizzle the oil! Gladstar writes that the solar infused method is the oldest and most highly regarded method of making herbal oils because it is the way of the ancients. It relies on sun energy and its radiant healing power. Option: to make the oil stronger you simply add in new herbs and let it sit for another week or two. With Spring here I will share an insect repellent oil. You can use this oil to make a salve (Next week’s post), or rub on a scarf/socks as long as you don’t mind the oil staining your clothes. Once the oil is complete (in whichever method you choose) add a few drops of lemongrass essential oil, eucalyptus, or geranium to give it a stronger scent to ward off those mosquitos! I leave you with this: whatever it is that you desire to accomplish, find time each day to focus on your intentions, believe in yourself, and make a step everyday no matter how small towards that goal. Have fun blending your own herbal oils! And follow me on Instagram @theyogiherbalist for more inspiration. Take care beautiful dreamers. I believe in you. < Previous When is it appropraite to not listen to your yoga teacher?